Read the Fall 2018 edition of the Home and School Connections newsletter here! Welcome to the 2018-19 school year! School officially begins on Wednesday, August 22nd for all students and will continue through Friday, August 24th which is an Early Release Day. Please make sure your child(ren) know their routine for Early Release Days as there are several throughout the year. Childcare is available at Leonard Elementary School. Also, please be patient with bussing the first few days as it will take us a couple runs to work out any kinks. There have been a lot of amazing things taking place at our schools over the course of the summer months and we are excited to share those things with you. Our staff has been working hard in preparation for the new school year – the buildings and grounds are in great shape and we are excited to welcome several new staff members to Ovid-Elsie. Many athletic events are scheduled to start soon as Ovid-Elsie enters into the inaugural season of the newly created Mid-Michigan Activities Conferences (MMAC). Please check out www.ovidelsie.org for more information or for sports schedules. At Leonard Elementary School, Mrs. Parsons has assumed the role of principal and will also assist Mr. Kirby in Special Education. Mrs. Becky Vincent has taken on the role of a Special Education Paraprofessional. Also, Anna Bosworth will fill a vacancy in 1st grade. Additionally, Mrs. Britney Nurenberg transferred from E.E. Knight Elementary to Leonard Elementary to teach 1st grade. Leonard Elementary will have an Open House from 5:30 to 7:00 p.m. on Monday, August 20th. Please remember that this is a time to meet your teacher and get familiar with your classroom and school environment, it is not a parent-teacher conference. At E.E. Knight Elementary School, Mr. Kris Kirby has assumed the role of building principal. We would also like to welcome new teachers Mrs. Amanda Badge (5th grade), Ms. Kaitlyn Thelen (3rd grade) and Mrs. Johnnie Lewis (3rd grade). We also would like to welcome Ms. Kaitlyn Welsh as she will service students with special needs and Mr. Chris Parker who will serve the District as a Special Education Paraprofessional. E.E. Knight will also host their Open House on Monday, August 20th but from 5:00 to 6:30 p.m.
Mrs. Wendy Coleman will fill the role as the new Elementary Librarian and Copy Center Technician. At the Middle School, Mr. Brian Powell has transitioned to Dean of Students where his primary role will be attendance and discipline. Also new to the administrative team is “Reaper” – Ovid-Elsie’s first K9 service animal. Reaper has been trained as a therapy dog and can also detect illegal substances brought into the school or in vehicles. You’ll see Reaper working throughout the District and at school-sponsored events. There are also a couple familiar faces back in the Middle School as Mr. Nick Hufnagel will continue as the 8th grade social studies teacher, while Mr. Zach Belill will move to 6th grade math and Mr. Justin Fluharty will take over 6th grade science. Mrs. Amanda Chaffee also joins the staff as a Special Education teacher. There will be a 6th grade orientation on Thursday, August 16th from 5:30 – 7:00 p.m. and the Open House for the Middle School will be on Tuesday, August 21st from 5:00 – 6:30 p.m. The High School also welcomes several new employees. First, Mr. Cory Gavenda will take over as the High School Assistant Principal while Mr. Joel Longstreth will serve as the Athletic Director while still teaching part-time as Mrs. Latz has transitioned to the Superintendent’s Office. Mrs. Jessica Gleeson will be the new High School Counselor, while Mr. David Pastula takes over as our new Physics teacher. Teaching mathematics will be Ms. Caron White while Mr. Michael Puffpaff will take of the Digital Media Arts program and Journalism, and Mr. Ben Smith will be stepping into the role of Industrial Arts teachers. Mr. Whiting will be around as a consultant but is the new radio station manager at MSU! You may also see another familiar face at the high school this year as Mrs. Amanda Bashore will be teaching choir and drama in addition to elementary music. We are also very excited to welcome Mr. Nate McNitt who will be teaching our students welding in our newly renovated metals shop. Further, in an effort to continue our dual credit opportunities, Ovid-Elsie Area Schools is partnering with the Ralph Nichols group and an anonymous donor to offer all freshmen the Dale Carnegie Course for Teens. This course will provide all freshmen who participate with three (3) LCC credits as Communications 130. The instructors for this course will be Mr. Matthew Anderson and Mrs. Alyssa Belliginer. Finally, Mrs. Monica Spicer will be working on a reduced schedule and will become our 6th through 12th grade counselor. There will be an orientation for freshmen on Monday, August 13th from 6:00 – 7:30 p.m. and the Open House for the High School will be on Tuesday, August 21st from 5:00 – 6:30 p.m. Please note that both Transportation and Food Service will be at all Open Houses to assist you with your bussing needs as well as breakfast and lunch information. We encourage all families to fill out the free and reduced lunch form, which is confidential and will be available for you at the Open House(s). Breakfast and lunch prices are the same as last year. We’d also like to officially welcome Mr. Bill Ehlert to his new position as Head Mechanic in the bus garage with Loren Bryant taking over as Assistant Mechanic. As mentioned before, our buildings and grounds crew and technology staff have spent the summer months preparing for the arrival of our students. They have done a brilliant job of getting our buildings ready and making sure that the infrastructure is in place to advance our teaching and learning. 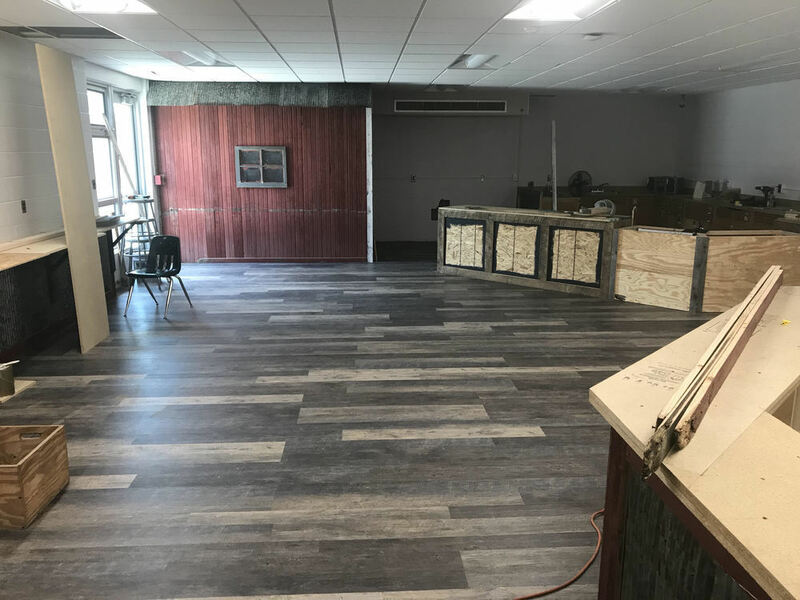 The new Marauder Café (formally the home economics room) has been designed and developed by Mrs. Baese, Mr. Whiting and Mr. Smith and will be ready to serve you for all of your spirit needs (pictured). Also, check out the new flooring in the High School Cafeteria as all of the old asbestos flooring was abated and replaced with a cool blue and gold chevron design. Mr. Whiting and Mr. Davenport developed a new website over the summer as well. The IP address is the same and there is also an app available for you in the app store for both Apple and Google. Finally, it is critical that all of your information is up-to-date in PowerSchool. PowerSchool is our student management system and it houses all of our demographic data, grades, etc. It will also be the main method of delivery for communication, so if you want to make sure you get those snow day phone calls, please make sure your information is correct. I would like to personally thank all those who have put in tireless hours to make our buildings look great, function properly and growing as educators through professional development. And, I would like to personally welcome you all back to school - we are looking forward to a great school year! Thank you and as always, Go Marauders!